Tyga was reportedly a no show at his pre-birthday celebration at West Hollywood’s Greystone Manor on Sunday (November 16). TMZ reports this is because the venue would not allow Tyga’s female guest, 17-year-old Kylie Jenner, access to the event due to California law. Tyga, who turned 25 today (November 19), has not confirmed his relationship status with the Kylie Jenner despite TMZ’s addition of the title GF. Tyga recently ended his engagement with Blac Chyna, the mother their son King Cairo. T-Raww spoke with Vibe in late October to say that he was not dating Jenner at the time. Ray J, the on-camera lover of Kylie’s older sister Kim Kardashian, told TMZ that Tyga needs to show more maturity in his personal life. 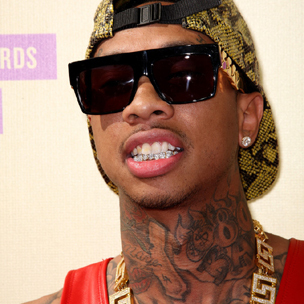 Tyga’s The Gold Album is due out December 23. He has not mentioned any plans to reschedule the event, nor his reasons for skipping the engagement. Tyga is scheduled to be in Moscow, Russia on Saturday (Novemebr 22).